Perhaps you didn’t score big last week on Black Friday, or Cyber Monday with a deal. Perhaps you were focused on getting the big screen TV or deep fryer. Maybe you were busy running a turkey trot. Or perhaps, you were just too busy eating the turkey. All fair excuses. I don’t judge. So for those folks, I’m giving you a chance to still score big. I’m giving away a Garmin FR10. Well, actually, I’m giving away two of them. One for him, and one for her. Or two for her, or two for him. However you dole them out is up to you. Except, that I decided giving away two wasn’t enough, so I’m giving away four of them in total. That’s two sets of two Garmin FR10’s. That way you can be all matchy-matchy like a Christmas Sweater party. Minus the reindeer sweaters. (Ok, I never expected finding a reindeer sweater on Amazon that awesome on my first result – that’s award winning!). So how do you win? Simple, just answer the below question in the comments. Only one comment per person. Though, both people in the couple may enter. 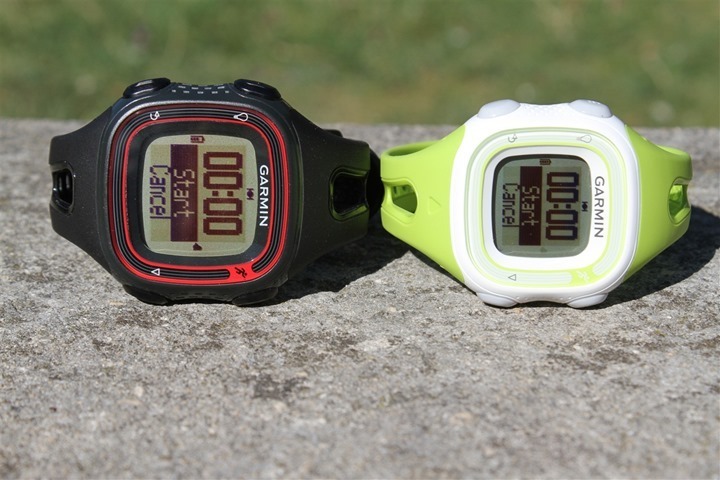 If you’re not a couple, then you can bestow the second Garmin on a friend. In doing so, maybe you’ll end up a couple. That’s not bad, right? Entries will be accepted through Sunday night, 11:59PM Eastern time (December 2nd, 2012). I’ll be giving away two sets, thus two two winners (with each winner really representing two winners). One set will include a black FR10 + a green FR10. The other set will include the black FR10 + the pink FR10. Winners will be chosen at random, and the first randomly chosen winner gets first pick. This giveaway is sponsored by Clever Training, which I recently announced a partnership with. As you probably remember, by picking up sports technology gadgets from Clever Training you support the site. And on top of that, all DC Rainmaker readers get an exclusive 10% off all products they sell (basically every sports tech company) using coupon code DCR10BTF (along with the link above). Regrettably, they don’t sell that reindeer sweater, so no discount there. No, I still can’t get over how awesome that artwork of a sweater is. Note, if you’re US Active Duty Military – you can submit your entry via e-mail instead. Note that this is ONLY for Active Duty military. No ice cream truck operators or elephant trainers allowed via this method. Mmmkay? Thanks all! There’s nothing like going to the beach in January, I’ll be running the ING Miami Marathon on January 27, 2013. Post-race I’ll be soaking in the Atlantic with a margarita in hand. New Years Day 5k in Reston. Thanks for the giveaway! Running the 26.2 With Donna Marathon in Jacksonville, FL in February! With the 2013 season nearly upon us – what’s going to be your first race of the year?” The Arcadia Brute 100Km ride. It will be my all year’s favorite race – 10km night run around the near lake. First race of the year is a New Years Day 5K! It’s my second race ever! I love running in the cold weather and can’t wait to PR! First race will be Ironman Texas in the Woodlands, TX! My first race of the year will be the New Year’s Day 5k in Knoxville. It’ll be my third runniversary! The first race I’m signed up for in 2013 is the Resolution 10k Race in Leesburg, VA on January 1st. Several months from now after building up a solid aerobic base. Likely a sprint tri, but which one is TBD. Hi, Ray! Thanks for your work on the site. Your reviews are awesome! I’m running the Krispy Kreme Challenge in February with my boyfriend. It’s a five-mile run split up by eating donuts. It’ll be my second “real” race…We’re running a 5k in a couple weeks too! I just had a baby and I’m not sure when I’ll be ready to race again. MCM is on my agenda for this year, though. My first race will be Carlsbad Marathon in CA in Jan 2013. First Race is The Purdue Challenge in April. does a champagne race at midnight with my friends count? The Missus will be doing the Gazelle Girl Half Marathon in April, and I’ll be doing the Riverbank Run in May…The Frostbite Marathon Relay(for fun) in January…it’s going to be a great year! Orcas Island 50K in February. 18K Hogpen Hill Climb on January 19th, known as one of the toughest races in America! Karri Valley triathlon, lake swim, rolling bike, trail run. Awesome. The Bridge Run here in Charleston, SC!